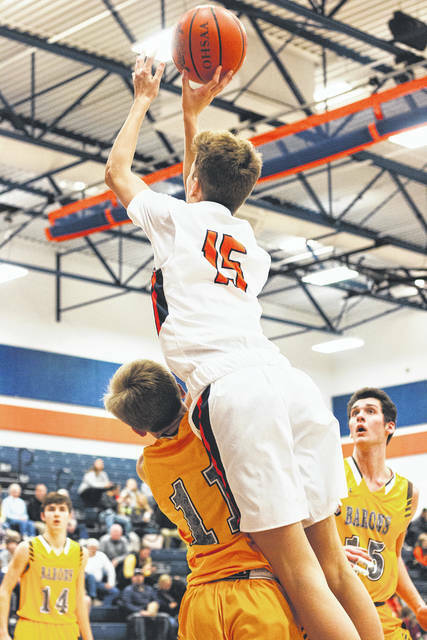 GALION — On Friday, January 11, the Galion Tigers boys basketball team welcomed the visiting Buckeye Valley Barons to town to compete in a Mid-Ohio Athletic Conference clash and their first of two meetings this season. Action came down to the wire but the home team would be able to hang on and finish on top when the buzzer sounded; 64-61. With the victory, the Tigers improve to 4-7 overall on the season and now sit at 2-5 in the conference heading into the second round of meetings within the league. The Barons drop to 5-7 overall with the loss and now also sit at 2-5 in league play. Things got off to a quick start for the hosting Tigers as they opened the game on a 9-2 before Barons head coach Andy Gast called a timeout in hopes of regrouping his squad. 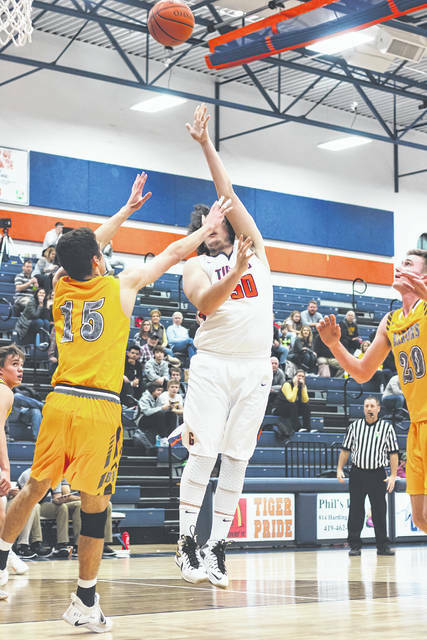 After the breather, things would continue much on the same course and by the end of the first quarter, Galion held an eight-point advantage at 20-12. Buckeye Valley looked to take the opening frame as a learning opportunity and would come out in the second on a 4-0 run of their own to inch within four points before Carter Valentine headed to the line and hit a free-throw to thwart the run. The Barons would remain on the path though and would take their first lead of the contest at 26-25 with 2:45 remaining in the first half, thanks in large part to a high, three-point field goal shooting percentage. After 16 minutes of play, the visitors would head to the locker room at halftime with a slim lead at 29-28. The third quarter saw Buckeye Valley continuing their sharp shooting and stretching their lead, albeit by just three points, to head into the final quarter of regulation up; 44-40. With three minutes gone in the fourth, Galion would overcome the deficit and take their first lead since the second quarter at 49-48. However, the Barons would retake the advantage on their very next possession to begin a series of back-and-forth scoring that would continue throughout the duration of the contest. With 3:36 left in regulation, the two squads would find themselves knotted at 51 points apiece and the score would again become tied at the 2:42 mark, this time at 55 each. Buckeye Valley would use a full timeout to try and swing the momentum but the game progressed much the same. The Tigers and Barons would tie again at 60-60 with 1:26 remaining and carry on the timeout-calling strategy implemented by most teams in a similar scenario. The score would be tied again with just 36 seconds remaining after Isaiah Alsip hit the front-end of a “1 and 1” free-throw attempt. Alsip proceeded to convert the second attempt as well to give Galion the 62-61 lead as Tigers head coach Matt Valentine called a full timeout of his own. Barons guard Dylan Herbert lost possession off of his knee under the Buckeye Valley basket with a mere, 12.4 seconds left. After a Tigers bucket to put them up 64-61, Buckeye Valley was unable to convert, bringing them seconds closer to the defeat. With the possession now with Galion, Alsip was fouled and sent to the line for another “1 and 1” with just 1.6 seconds remaining in the game. Alsip rimmed out the front-end and the Barons immediately used their final timeout to draw up a potential, game winning heave. That attempt from half court would miss wide right as the buzzer sounded with the Tigers surviving for the three-point victory. Alsip, the top scorer in the MOAC, would lead all players in scoring with 25 on the evening while Herbert was the top contributor for the Barons with 18 points. As a team, Galion shot 22/44 from inside the arc and converted 4/10 from the perimeter. At the free-throw line, the Tigers finished at 8/14. In total, the home team amassed 39 rebounds (14O, 25D), 10 assists, eight steals, four blocks and committed 15 turnovers. 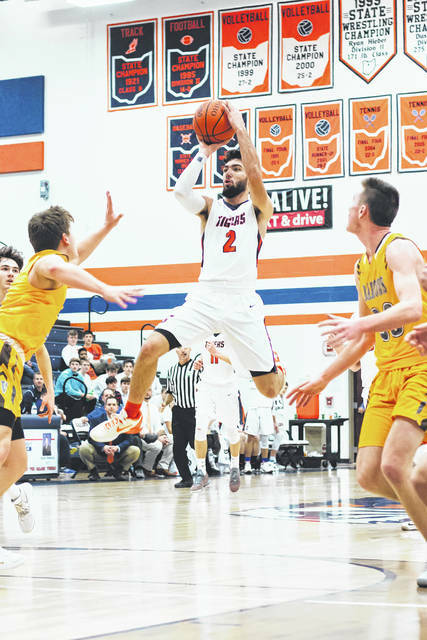 Other stats in the win for Galion were: Alsip- 6 rebounds, 3 assists, 3 steals; Gage Lackey- 12 points, 8 rebounds, 1 assist, 2 steals, 3 blocks; Valentine- 10 points, 3 rebounds, 1 assist, 1 steal; Tristan Williams- 9 points, 2 rebounds, 1 assist, 1 block; Jack McElligott- 6 points, 7 rebounds, 1 assist, 1 steal; Hanif Donaldson- 2 points, 4 rebounds, 2 assists, 1 steal and Carter Keinath- 2 rebounds, 1 assist. A pair of home conference games await the Tigers this week, starting with the Pleasant Spartans on Thursday, January 17. 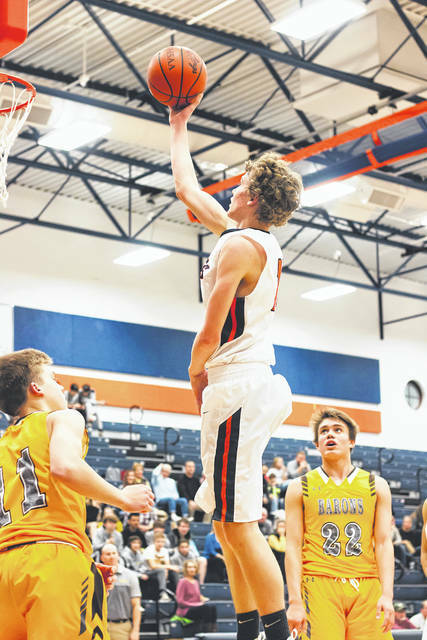 On Saturday, January 19, Galion will welcome the River Valley Vikings to town to compete in their second contest against one another this season.